This book contains contributions in English and German. 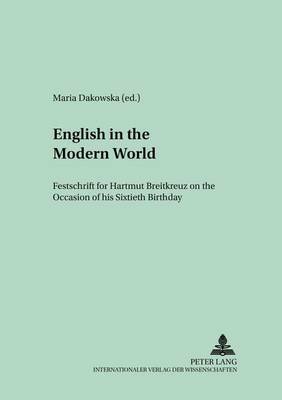 The festschrift volume English in the Modern World presents an international collection of seventeen articles. The contributions from individual scholars or teams of experts have been divided into eight sections addressing mainstream concerns in language studies within the English-speaking world. A variety of articles has been directed to aspects of learning and teaching English as a foreign language at university as well as primary level, especially to error and strategy research in such areas as phonetics, lexis and pragmatics, followed by a cross-linguistic analysis of false friends in English and German phraseology and, finally, the potential of the Internet and video technology in language teaching. In addition to the didactically and linguistically oriented investigations, it is rounded off by three studies in literary criticism and one in American Studies. The honoree, Professor Hartmut Breitkreuz, has held a chair at the Educational University of Heidelberg/Germany since 1974. Throughout his career he taught and published in such fields as foreign language didactics including teaching methods, collocational learning, error analysis, applied linguistics specialising in false friends and pseudo-anglicisms, modern English literature, literary onomastics and intertextuality.